Minor teeth imperfections such as discolouration and cracks can do great damage to your smile. With porcelain veneers, this is no longer a problem. Veneers are cosmetic dentistry equipment attached to the front surfaces of the teeth to mask any imperfections. Read on to learn more about veneers. Porcelain veneers are tooth coloured ultra-thin layers of porcelain customized to the patient’s measurements. Hence each veneer is unique to each patient and is nearly impossible to distinguish from a natural tooth. With proper care, veneers are proven to last 10-15 years. The placement process is minimally invasive and achieves a natural appearance, strength, protection, and durability. The first step in determining if porcelain veneers are right for you is visiting Ria Family Dental. Not all patients are suitable for this kind of cosmetic dental treatment. Note that one’s mouth is different from another and veneers are one of those treatments that need careful consideration. Hence, Ria Family Dental will help you determine if you are qualified for the treatment or not. 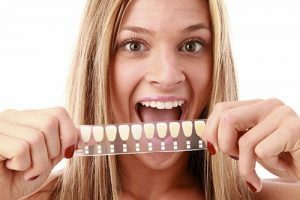 In order to achieve your desired smile, a smile analysis is performed by a dentist to decide the necessary steps to be taken in this operation. A diagnostic mock–up by the dentist, which allows you to try on veneers, may also be created to successfully develop the perfect veneer for you. “Cosmetic imaging” is another step that dentists use, to demonstrate an image of the final result. The procedure of placing dental veneers can be completed within a span of six weeks, in only two to three appointments. The procedure involves assessment, trimming of the tooth, selecting a matching shade of porcelain, taking tooth impressions, and bonding veneers onto your teeth.